As was the case in Ireland, I have to give the weather lots of credit for our wonderful experience of Scotland. 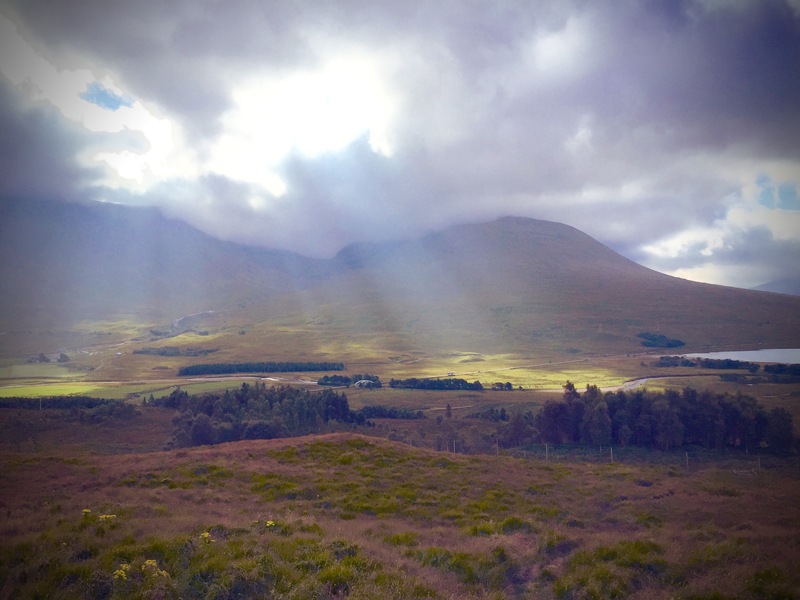 Our tour guide (a native) commented in the Highlands that she had seen such clarity in the notoriously harsh weather challenged mountains less than a half-dozen times in her life. Even without being told how lucky we were, we knew it, and were bowled over. 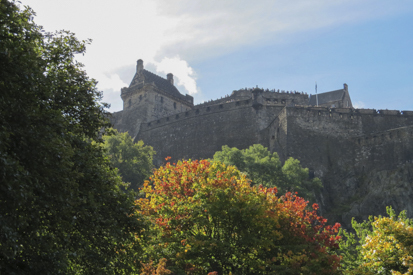 Scotland has everything: mountains, lakes, seascapes, big skies, desolate ridges, lush glens, gardens, ruins, castles, historic drama and tragedy, colorful characters, notable festivals, good food and whiskey, and a sense of humor. We didn’t try haggis, but enjoyed salmon with neeps and tatties (turnips and potatoes) often. Scrumptious cakes, shortbreads and toffee (laced with whiskey) were the perfect ending to delicious meals. And then there’s Edinburgh. Divided roughly into a two areas, a medieval Old Town between imposing Edinburgh Castle and the Palace of Holyroodhouse, (the Queen’s official residence when in town) and New Town (built in the late 1700s with beautiful Georgian architecture), it’s all remarkably walkable and sustained no WWII damage. There are many delightful pubs along the way when the hilly terrain requires a rest. It’s quite lovely; one could sit in the Princess Street Gardens between the districts all day just to view the Castle above it. 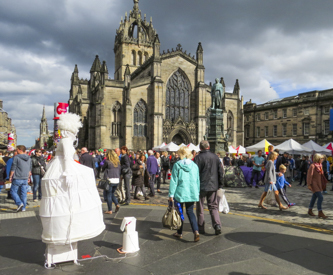 We were there for during the Edinburgh Festival, held annually since 1947 during the last three weeks of August. It is considered one of the world’s most important arts festivals, with theater performers overflowing venues and on the street in a Fringe counterpart. The Edinburgh Book Festival is held at the same time and takes over a city park with tents full of authors, publishers, critics in discussions and readings for days. 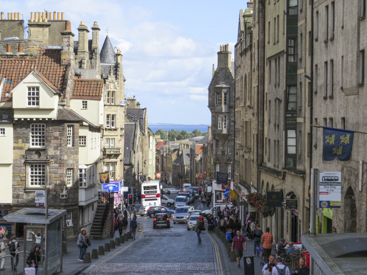 Edinburgh is UNESCO’s designated City of Literature. 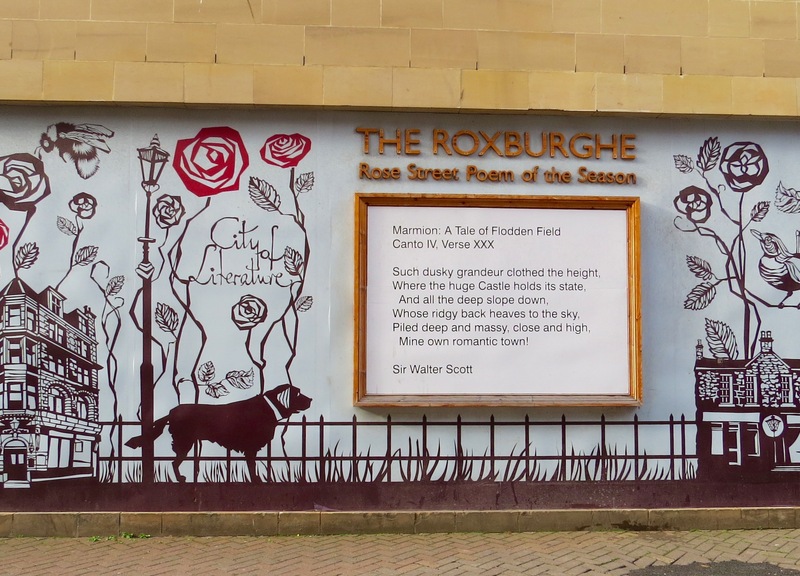 When I discovered the “poem of the season” painted on the side of a building near our hotel, I began to get a sense of their deep cultural pride. We noticed that it was perfectly acceptable to read a book in a pub instead of surfing the internet. Who knew? 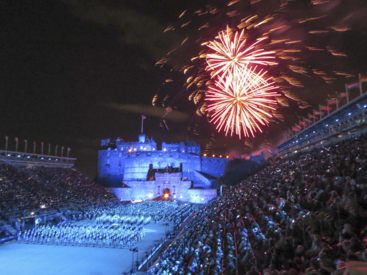 One festival highlight is the Military Tattoo, held at night at the foot of Edinburgh Castle. It is a spectacle of infantry battalions and Scottish pipe bands, too difficult to describe effectively. It is simply wonderful. 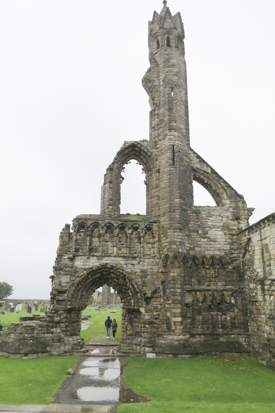 Yes, to answer golfer questions: husband and son played St. Andrews old and new courses, (“new” meaning opened in the late 1800s) along with several others in the area, and departed feeling satisfied and gratified. 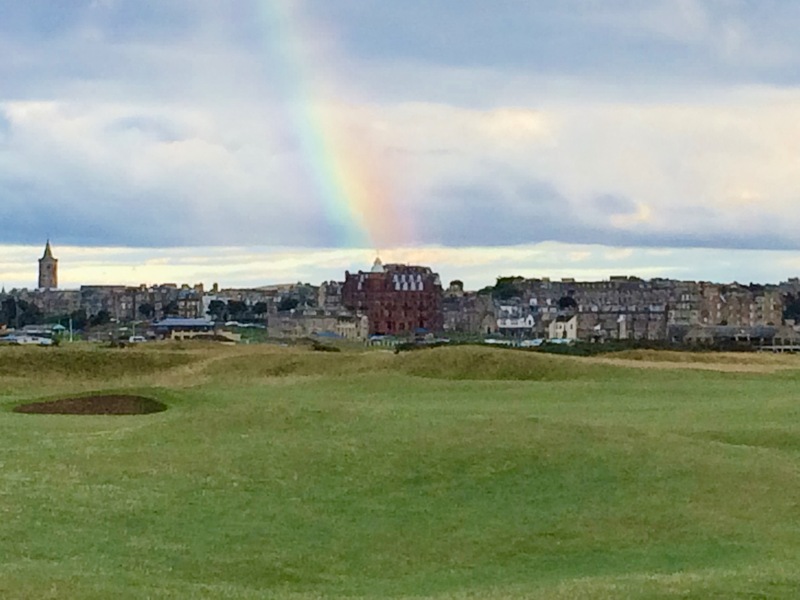 They finished the old course as a rainbow appeared over the Royal and Ancient club, which summarizes the entire trip: it far exceeded expectations, and absolutely left a mark on us. (More photos available through Flickr link). Of all the pre-trip anxieties I listed in my earlier post, only one occurred, and it’s included among the realities that greet me on returning home: mounds of bills and laundry, an overgrown yard, lack of motivation to resume exercise in spite of extra pounds, no food in the refrigerator, hours of time warp with broken sleep patterns and the dreaded respiratory revenge of travel (which now requires steroids and antibiotics, thanks to those coughing seat mates I was anxious about). Having been away nearly a month, there is a price to pay to be sure. I do not enjoy this re-entry period. When I resurface, a few kind friends will ask if we enjoyed the trip, and of course the answer is yes. 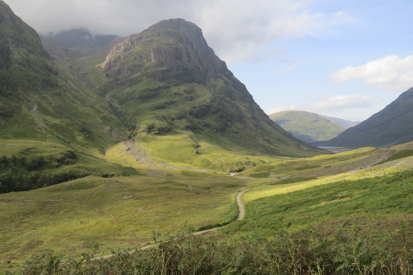 They will ask about the weather (unusually wonderful for traditionally rainy Scotland and Ireland), what we enjoyed most (Scotland) and would I recommend the tour company (for some things). After I sort through the several thousand photos I shot and reduce them to a coffee table book for use in the nursing home when I need to be prodded to remember things in a few years, all will fade and I’ll return to “normal” life and routine. But I have to say I’ve been marked by the experience. Tours are challenging. They are slightly less expensive and less trouble than travel on one’s own (particularly in countries such as Ireland and Scotland where driving is done on the left side of the road in cars in which the driver sits in the right front seat…I found it constantly disconcerting to see the person in the left front seat blissfully asleep or reading as we passed by.) Good tour guides offer a great deal more wonderful information about the history and current culture of a country than I would ever assimilate through guide books, and our Scottish tour director was sensational. In between offering history lessons and fables and “it’s absolutely true” stories (most of which were wonderful myths), she shared local music on our long bus rides which told the tales with even more clarity and poignancy. It was enriching to ride with her. But tours are exhausting. Up at 6 am, suitcases out at 7, leave at 8 for a long day, often including an evening event. In 14 days on the road with the tour, only two stops included two nights in the same hotel. Even if the busses are “luxury”, with great leg room as ours was, the rides can be tiresome, and they don’t stop where and when I might like them to. And I am inevitably sitting on the “wrong” side of the bus for the best sights of the day… it got to be a joke with us, and frustrated me immensely. Tours also mean spending a lot of time with total strangers, of all ages and nationalities. It takes at least a week to “settle in” with a group and sort out the comfort zones (which requires some effort), but it’s interesting that it really does occur, and by the second week a level of relaxation and enjoyable silliness asserts itself and becomes quite pleasant. New best friends, probably not; but we have had it happen! In this post travel trough, I ask myself if it was “worth it”, but don’t have to think about it for long. There are lots of great cities throughout the world, magnificent cathedrals to see, crumbling castles, vivid history brought to life and echoes of courage to hear. How else can one witness the blood-soaked highlands of Scotland on a perfect day when the hills are covered in blooming heather and gorse if one doesn’t leave the house?